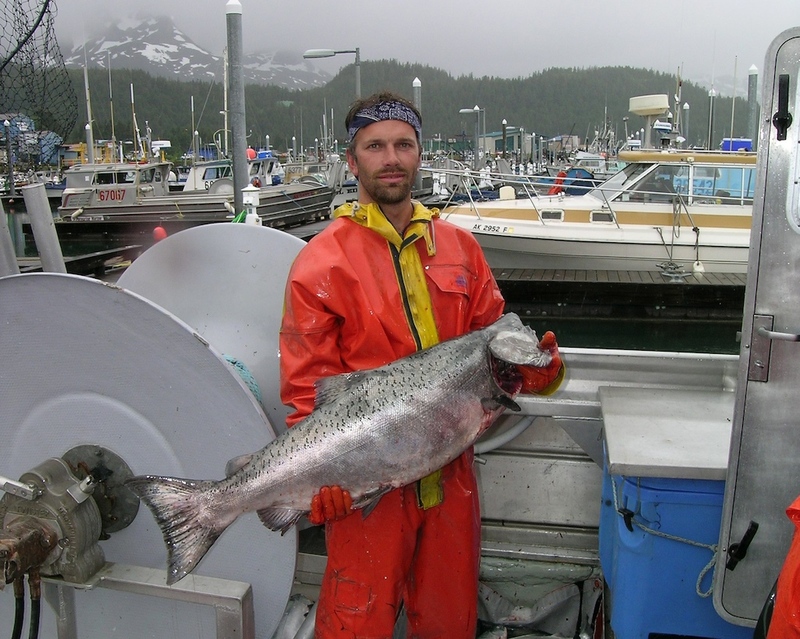 The Kings of Spring are in the house, and the best salmon of the year is in Tony’s Markets right now – King and Sockeye Salmon fresh from the Copper River of Alaska! 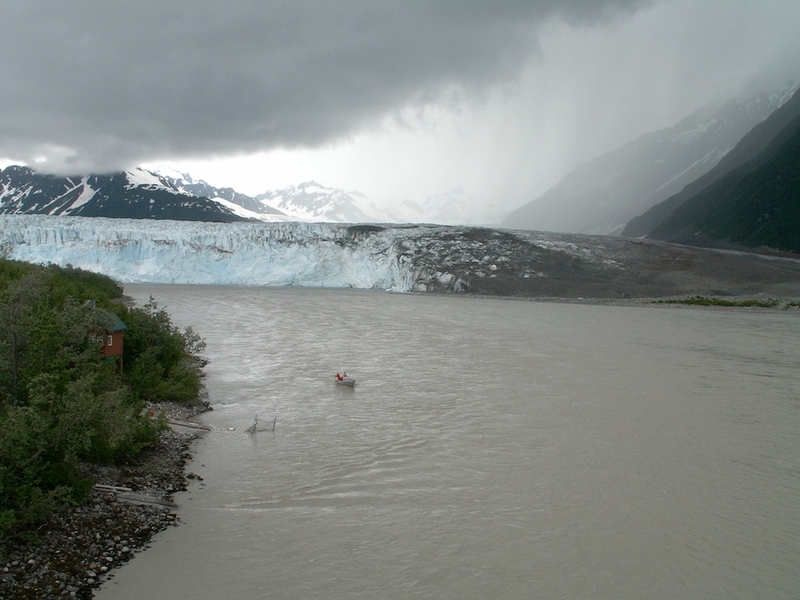 (Copper River Salmon arrives mid to late May every year). 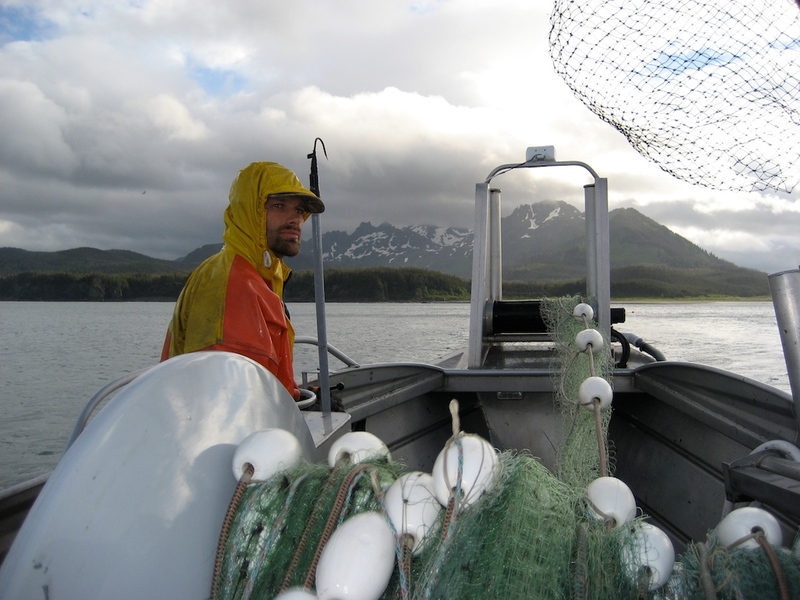 We were the first market in Colorado to carry Copper River salmon, and we’re still the most consistent and freshest of all markets in town – because we have our own fisherman! I went fishing with Dennis and have lots of pics and a video – we’ll let them tell the story… (brief video at end). 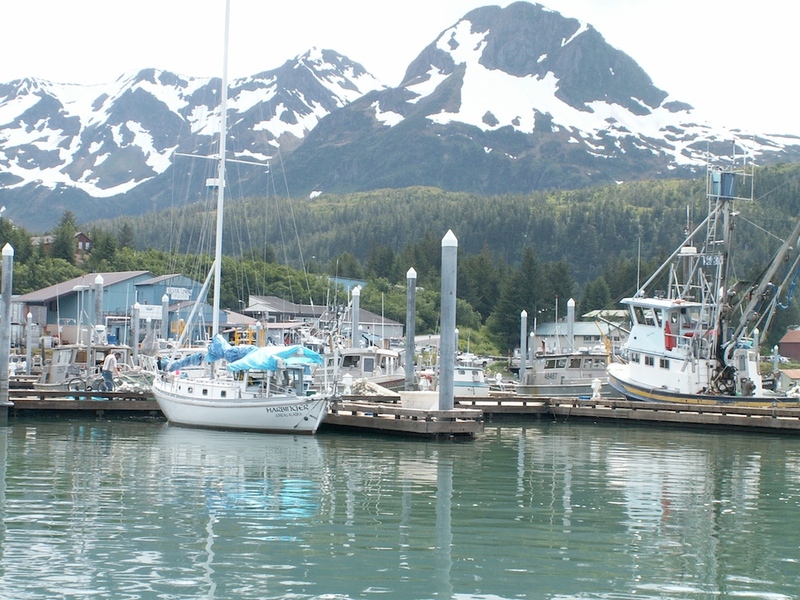 We start by loading the boat with LOTS of ice – the Mehgan Denise (named his boat after Dennis’s daughter) is specially designed for fishing the Copper River – with a flat bottom and two Chevy 350’s driving jet engines, that’s what it takes to cross the flats and maneuver the high seas of Alaska. Once we get ice, gas and a cooler full of food, we’re off for the fishing grounds and 72 hours of non-stop fishing, or should I say work! 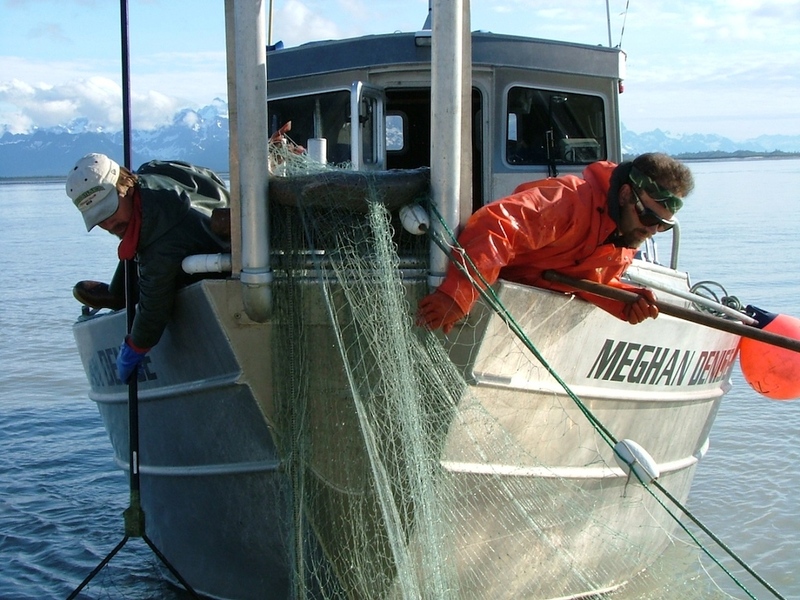 smaller nets are used for sockeye, larger nets for Kings. where the water is very murky, can you see the clearer colored sea off in the distance? which cannot cross the delta, so they take days to reach port. couple hours overnight but Dennis never stopped fishing for over 48 hours! tracking successful spots from last year marked in his GPS. and then hauled in and removed by hand. In between sets the fish are cleaned, sorted and iced. 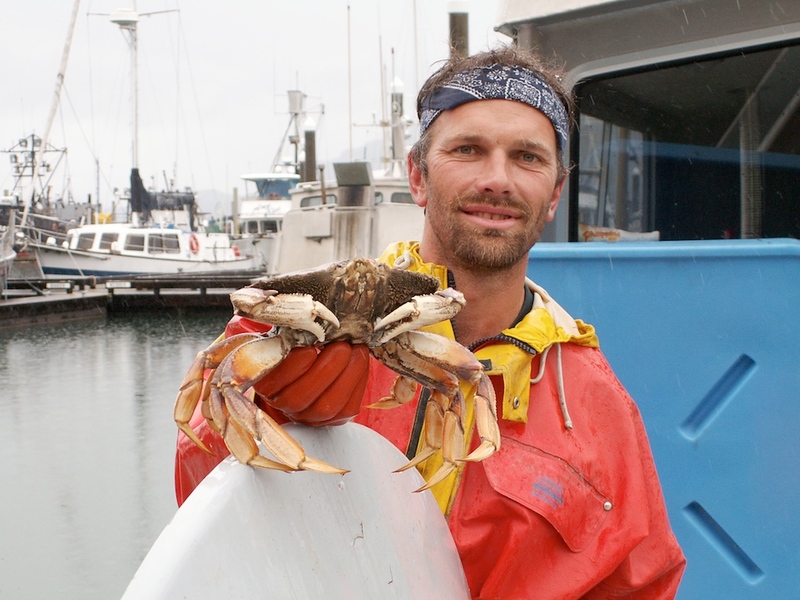 Dennis saves his prime fish for us and the rest are traded with cannery tender boats for gasoline. 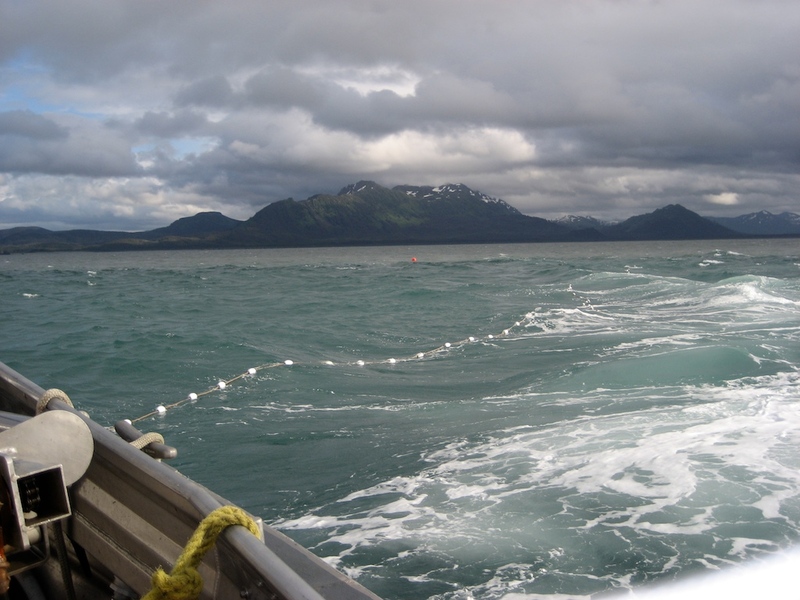 Fish and Game monitoring the laser fish counter – ensuring enough fish have escaped before each opener. the boat rocked a stomach churning dance and it was soooo cold – but the view was AMAZING! 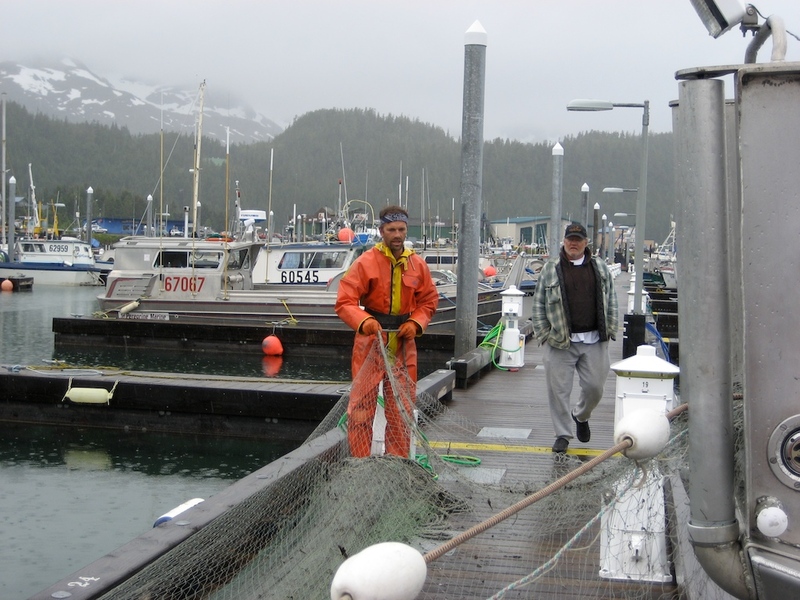 Dennis fished the last 24 hours on the lee side of Wingham Island to block the cold wind. Not a huge haul, but not bad – now they have to be cleaned and iced. 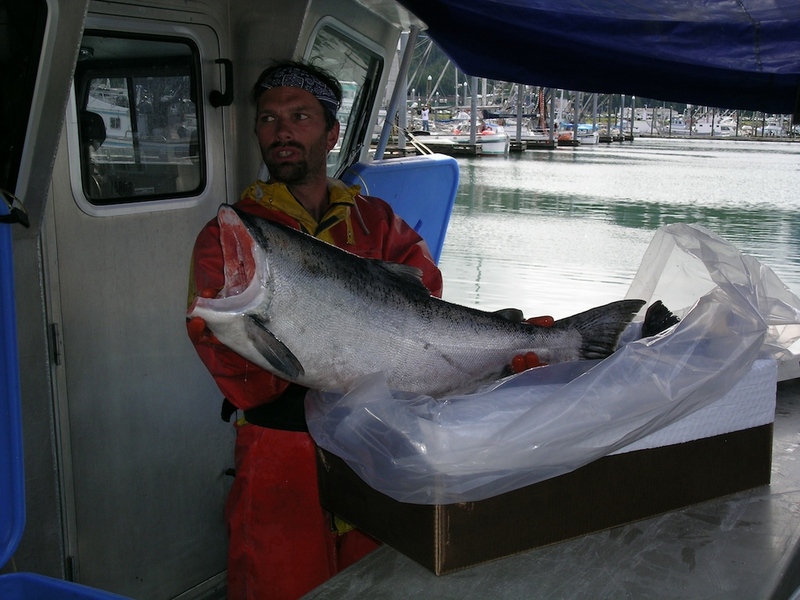 Back in Cordova, Dennis shows off a beauty of a King – the Kings of Spring! 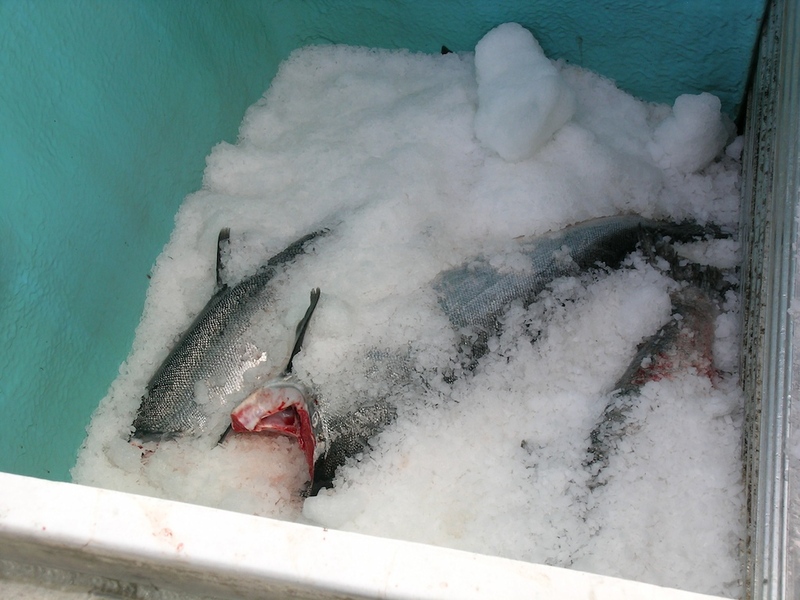 Dennis’s prime fish are cleaned and iced at sea, and then air-freighted directly to us, the rest are smoked or sold to the cannery. From what I could see most other fishermen don’t bother to ice because all their fish go to the cannery for a set price. 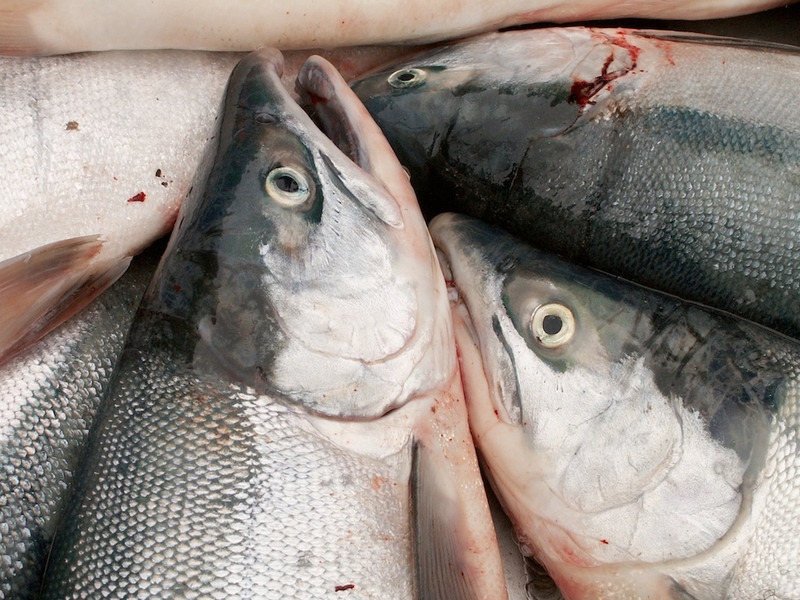 Cannery fish also face a week or more of travel to their final destination. 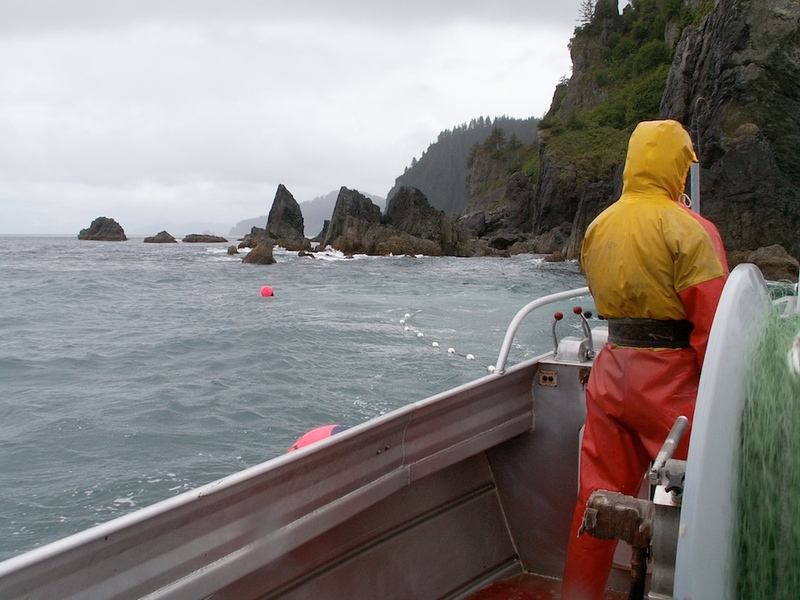 After seeing how it works first hand, there is no question that our fish are the best quality possible. We dropped the bruised fish (most of them) off at the cannery tender boat, trading them for gas (you think gas is expensive here!) and a hot cup of coffee and headed home. At the dock Tony’s fish went right into cooler boxes and his wife Alicia drove them straight to the airport – they should be at DIA in 24-36 hours. 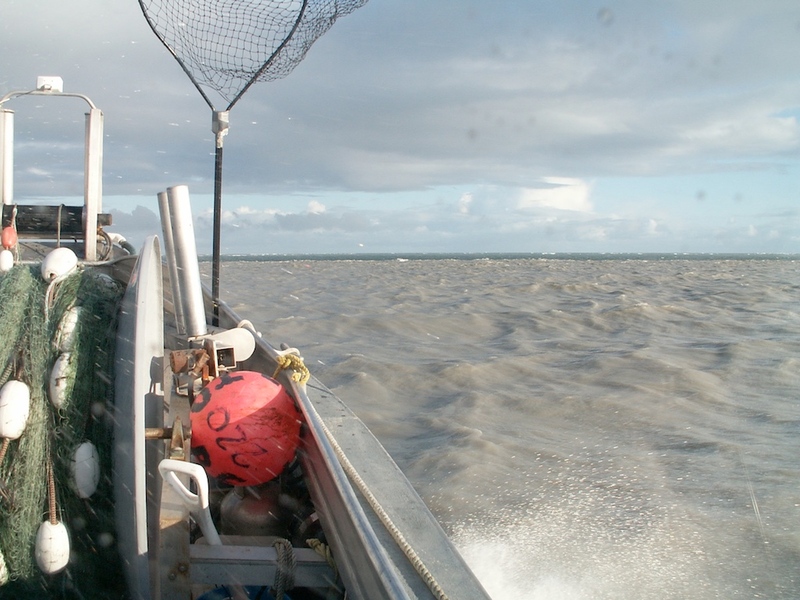 To save money, cannery fish are loaded onto these containers to be barged to Anchorage or Seattle – not only do we get prime, unbruised fish that are cleaned and iced shortly after catch, our fish is flown right from the fishing boat so ours is MUCH fresher than most. 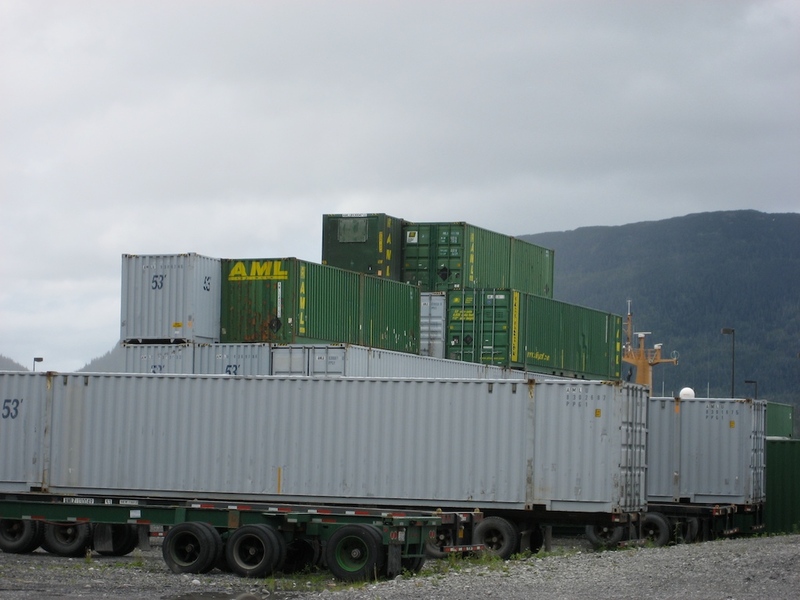 Cordova port – can you see the dancing lady and the bear on the mountain? A couple of days with little sleep and a couple cold Alaska Ales and you can! Look hard, they are facing opposite directions. 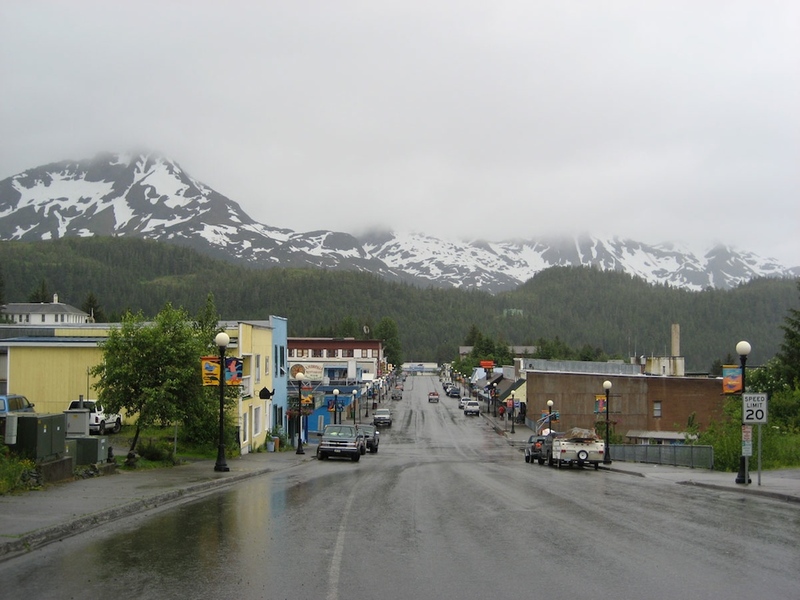 Downtown Cordova – the folks are wonderful, the food is hearty and it never seems to stop raining. 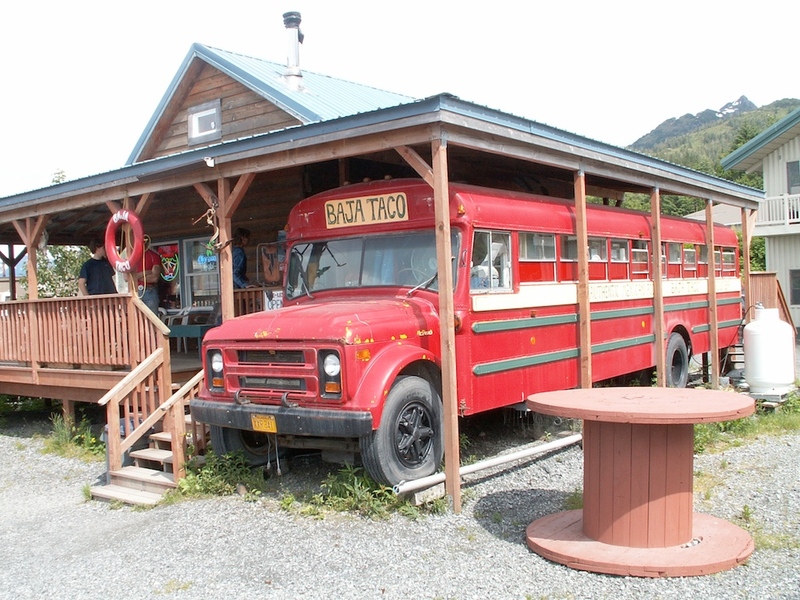 The Baja Taco bus was one of the best restaurants in town, actually it was GREAT! 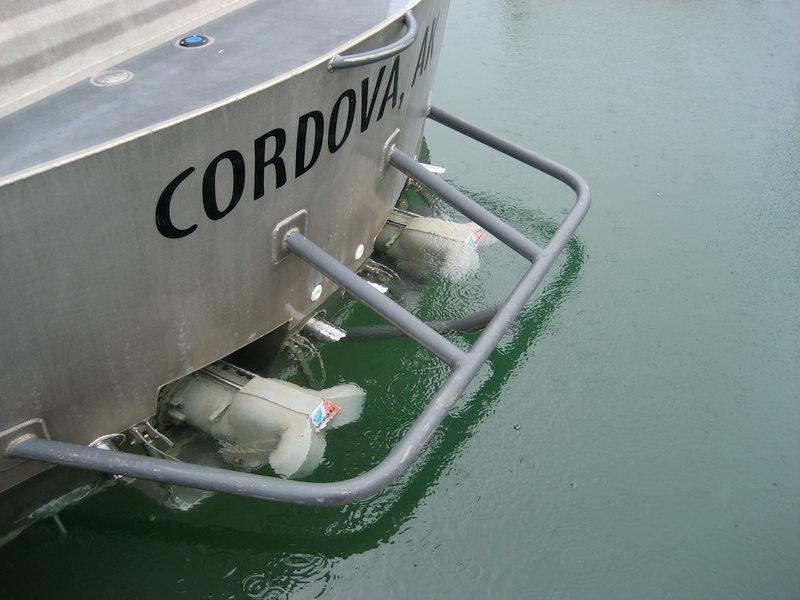 The owner drives to Cordova for the summer and back to Baja California every winter. 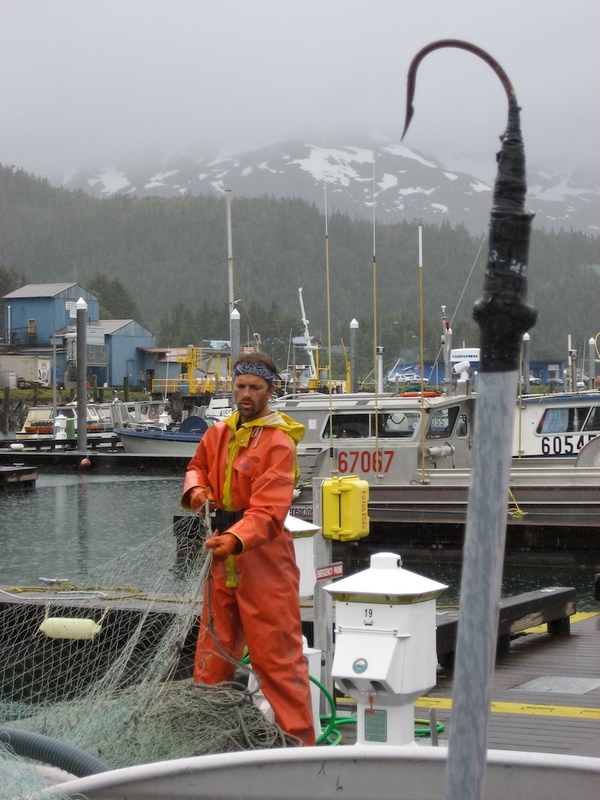 The nets need a lot of work after every trip – here Dennis is hand mending tears from snags on rocks. Maintaining the boat and packing an unpacking for trips is a LOT of work! 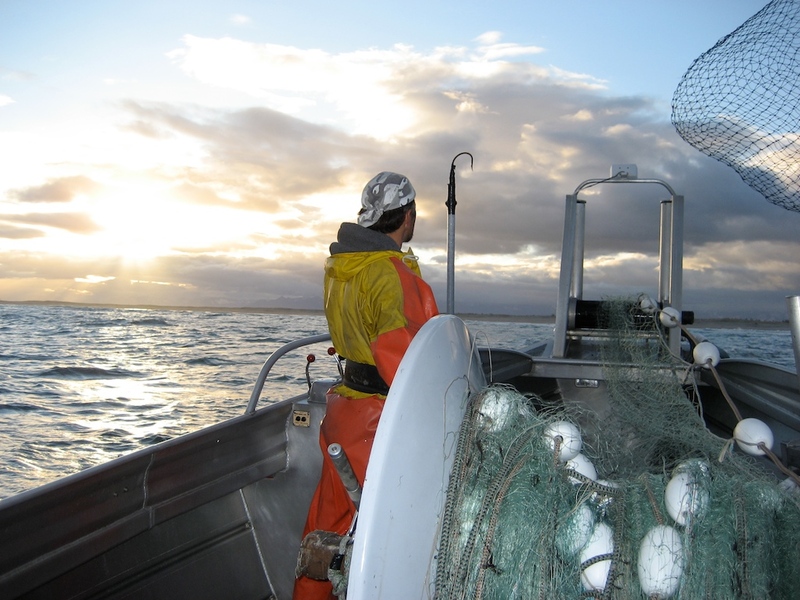 Occasionally something else gets in the net, but not much – we also got this crab, a ling cod and a Dolly Varden. 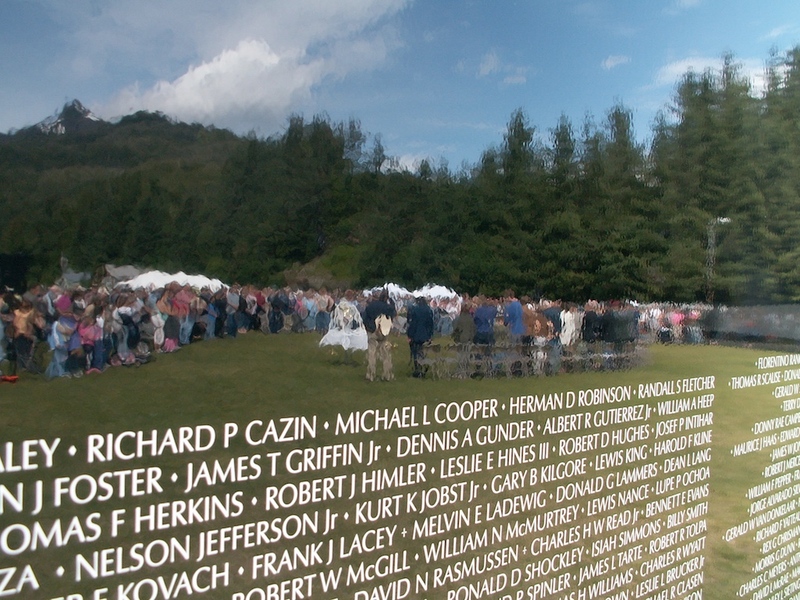 The Vietnam Veteran’s Memorial Wall was in town, so the whole town turned out for a picnic. 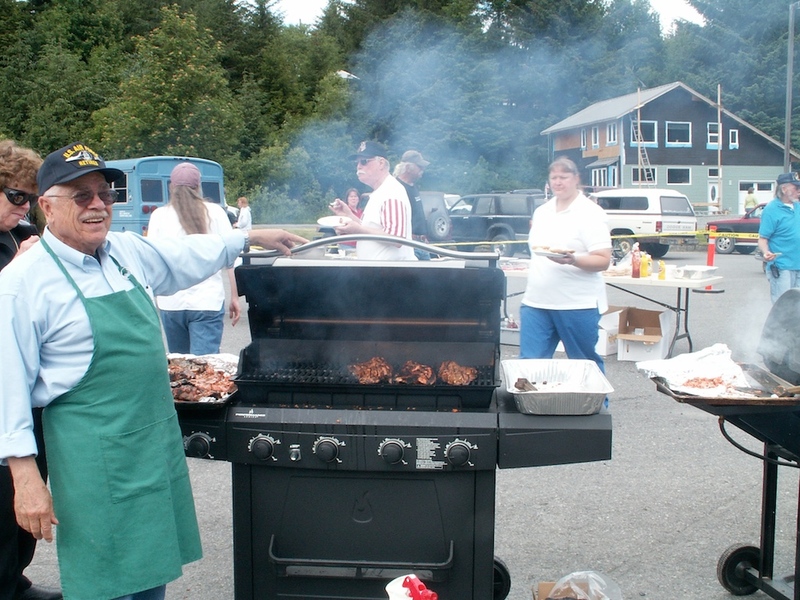 I was lucky to catch this town BBQ near the Memorial Wall – Copper Kings grilled by a vet on the summer solstice with homemade side dishes and homemade cakes – it doesn’t get any better! 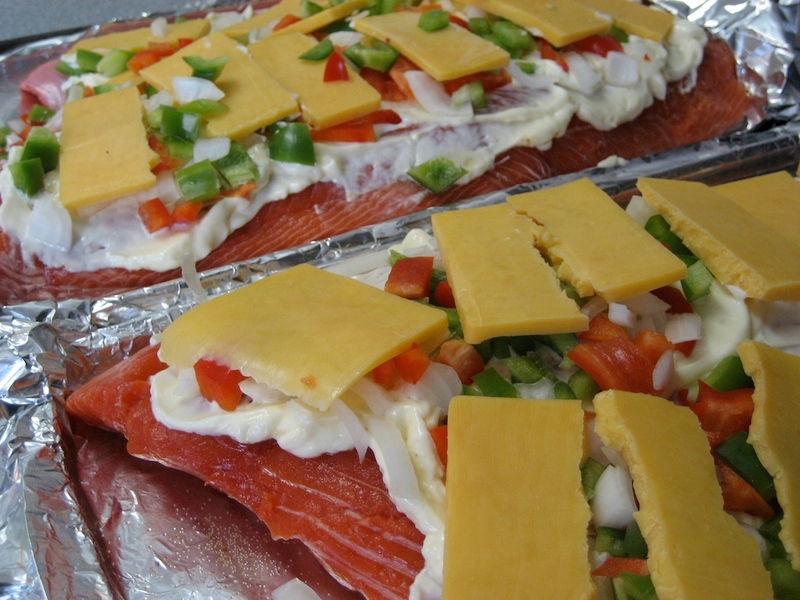 A local favorite – salmon covered with garlic salt, mayonnaise, peppers, onions and cheddar – um,,, well,,, a little different and not the way I would approach it, but not bad! I grilled some teriyaki salmon satay as well as chicken fried Moose cube steaks – YUM! 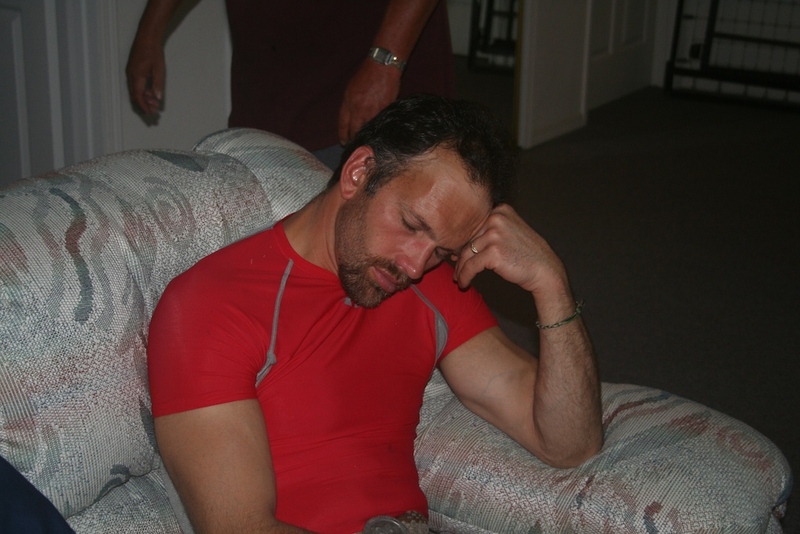 Dennis can’t stay awake long after a 72 hour opener, one of the few times he wasn’t smiling the whole week. 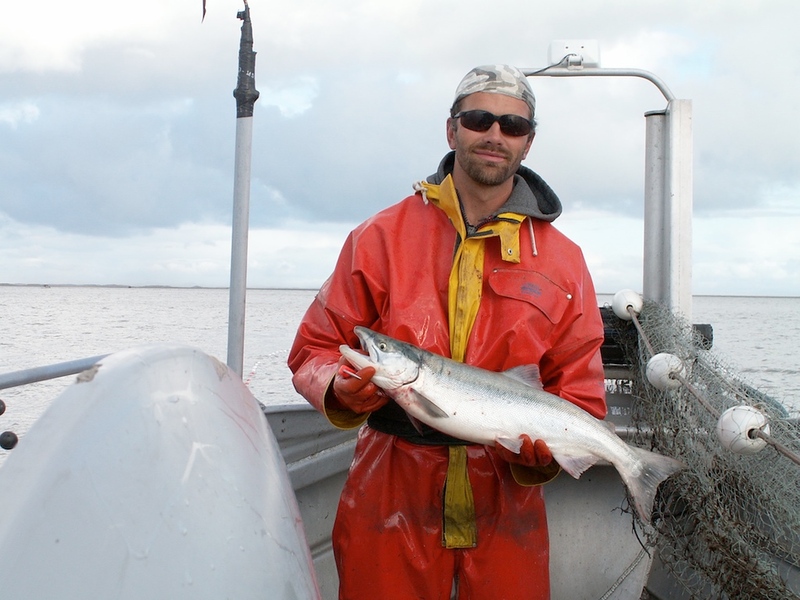 Recipes with the next post – cheers and go buy some salmon!